Emperor Charles the V, in order to develop a united front against the Turks, decreed that an Imperial Diet would convene at Augsburg for the purpose of dealing (among other things) with the “Evangelical Problem.” The Emperor announced that the diet would convene on April 8, 1530. Prior to the diet, the outlook for the new Protestants was far from hopeful. The Emperor had completed his conquest of Italy and was now in a position to quash the Protestant uprising in order to gain a united front against the Turks. The only obstacle left in front of the Emperor to deal with was the unresolved issue of Germany. The religious upheaval had its run, and it was time to act. Making matters even worse, the evangelical princes appeared to be hopelessly divided. Elector John the Steadfast commissioned Luther, Jonas, Bugenhagen and Melanchthon to prepare a document treating especially those articles on account of which such division was occurring. The group of men worked on the statement and presented it to the Elector in Torgau. These Torgau Articles, as they were called, treated especially those doctrines where differences caused divisions. They were presented March twenty seventh and the delegation left for Augsburg on April fourth. The document sent to Torgau treated the following articles of faith: Human Doctrines and Ordinances, Marriage of Priests, Both Kinds in the Mass, Confession, the Power of Bishops, Ordination, Monastic Vows, Invocation of Saints, German Singing, Faith and Works, the Office of the Keys (Papacy), the Ban, Marriage, and the Private Mass. The Marburg Articles were authored by Luther and were the initial Lutheran statement of faith. Luther drew up these fifteen articles in 1529, six months prior to the Diet at Augsburg. It is somewhat commonly held that it was on these Marburg Articles that Melanchthon based the teachings contained in the Augsburg Confession. While it may be true that Melanchthon, as a foundational document, used the Marburg Articles for the Augustana, what he developed at Augsburg is a far more complete work and obviously bears the mark of his unique style and scholarly approach. While still at Coburg, Melanchthon was commissioned to author what would be considered a vindication of the manner in which the Elector of Saxony had stewarded religion in his lands. Luther, who was still considered a heretic and outlaw, could not attend the diet, though he desperately wanted to go. Instead, he had to stay in the Castle Coburg during the entirety of the proceedings. Luther left the diet to Melanchthon who became Luther’s chief representative there. It was Melanchthon who wrote the Augsburg Confession, though he communicated with Luther daily by letter, making sure that everything was to his liking. Melanchthon was still compiling this vindication on the second of May when the Electoral party entered Augsburg. This vindication presented at Augsburg was to be a refutation of Johann Eck’s 404 theses. In them, Eck found it necessary to quote snippets, out of context, from Luther, Melanchthon, Carlsdadt, and Zwingli, labeling all of them as heretics. At the Diet, Eck defended his theses against the Protestants. What was used as the defense against Eck was Melanchthon’s Protestant Confession of Evangelical Faith, the Augustana (Augsburg Confession). Melanchthon had assisted in the composition of both the Schwabach and Marburg Articles. He used these prior documents and reworked the ideas therein to fit the changed situation. The time constrained authoring of the Augustana caused great angst, for the part of Melanchthon that was never satisfied with his own literary output. Melanchthon believed that he was compiling the true evangelical doctrine. Luther had, at least in large part, developed this new evangelical doctrine. Melanchthon valued Luther’s opinion highly and sent the first draft to Luther for examination. Luther returned it to him with utterances of only praise. This confession was to be not Luther’s theology, or Melanchthon’s theology, but the theology of evangelicals. 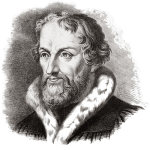 This theology did not belong to Luther nor did it belong Melanchthon, it belonged to Christ. 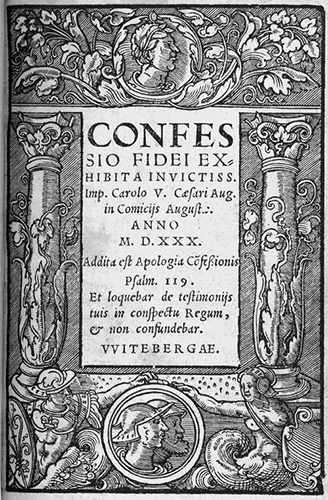 On June 15, 1530, the Confession was read. The Augustana was improved, polished, perfected, and partly “recast” right up until the moment it was read. Even after Luther read the document, many changes were made. It would not be until June 23, that those in attendance signed the Augustana. On June 24, Cardinal Campeggio lobbied for complete suppression of the Protestant sects. On June 25, Christian Bayer read the Augustana to the Emperor a portion of the assembly for a second time. What Melanchthon had prepared at Augsburg was to become the first and formative Creed of the new Lutheran Church. Dr. Bayer was said to have read the document so loudly that even those standing outside the hall heard him clearly. In June of 1530, the Princes and Electors of the free Protestant States of Saxony signed the Augustana. The signers were “Christian heroes, who were not afraid to place their names under the Confession, although they knew it might cost them goods, and blood, life and limb.” Among these heroes was Elector John. “When Melanchthon called the Elector’s attention to the possible consequences of signing the Augsburg Confession, the latter answered that he would do what was right, without concerning himself about his electoral dignity; he would confess his Lord, whose cross he prized higher than all the power of the world. Luther praised the elector for risking bitter death at the Diet of Augsburg.” The signing of the Augustana on June 30, 1530, is considered the birthday of the Lutheran Church. C. L. Manschreck, Melanchthon: The quiet reformer (New York: Abingdon Press, 1958), 174. Philip Schaff and David S. Schaff, History of the Christian Church (New York: C. Scribner’s Sons, 1882), Vol. vii, 709. Manschreck, Melanchthon the Quiet Reformer, 177. Ibid, 178. From: Johann Michael Reu, The Augsburg Confession a Collection of Sources with a Historical Introduciton (Saint Louis: Concordia Publishing House, 2005), 97-98. F. Bente writes in his Historical Introductions to the Symbolical Books of the Evangelical Lutheran Church, 20. Ibid, 44. See CR:10, 198.